If you ignore the leopard print belt and shoes for a second, this khaki double breasted blazer from Trussardi 1911 is to die for. Looking at the Spring Summer 2011 collections from various designers, it looks like khaki is making its way back this season and why shouldn’t it? Two tone neutrals have always borne simple natural elegance- a classic men’s look, especially if you don’t want to look to dour and sombre towards the weekend. Embrace khaki (not just khaki trousers); they’re your best friend. Here are a couple of tips on how to wear khaki. 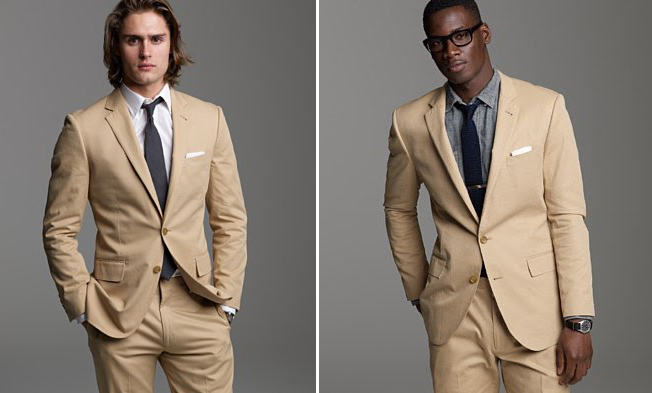 Embrace the khaki suit.You don’t have to dress like the Mad Men every day. Thursdays and Fridays are a great time to enjoy a khaki suit. Two days before the weekend, a more professional look can be achieved with a dark grey shirt and matching black tie. As Saturday beckons, go white with your choice of matching complimentary ties. Heck, even the deadly serious enjoy subtle sophistication. Left: Italian Chino J. Crew suit. Right: DKNY Khaki. Top or bottom (get your filthy minds out of the gutter), it matters not where the khaki caresses. 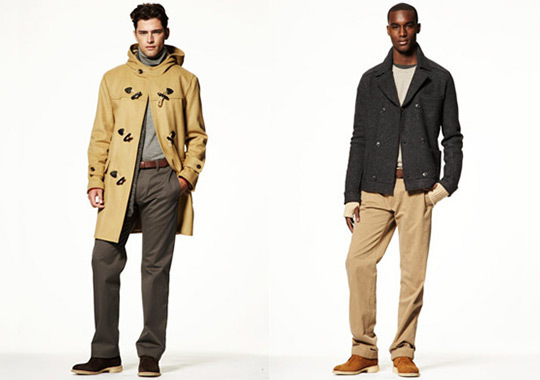 Shown below, all weather trench can be layered upon grey toned casual or business wear. Vice versa, dark grey or black blazers and waist coats can be laid upon khaki trousers. Personally, I enjoy grey cardigan on white v-neck tee over khaki. The best thing about khaki combos- as essential garments and sartorial staples, they’re available in high street stores for very affordable prices; evidence that you don’t need money to dress above your paygrade.